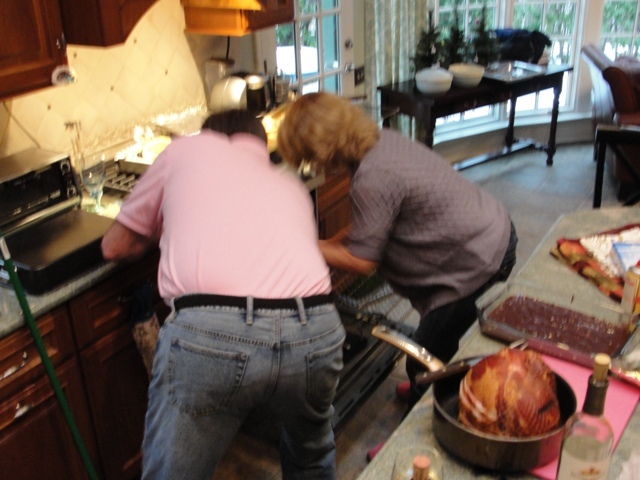 Do you see Bob and me huddled over that oven? That was our Christmas dinner we were trying to save. I had my parents, Bob’s parents and all the kids for dinner. I made honey baked ham, scalloped potatoes, green beans and almonds and my famous acorn squash. It was the squash that did me in. I had everything in the oven with just 15 minutes to go before dinner was to be served. Then I decided to add just a little more water to the bottom of the big mtal pan that held the squash so that they wouldn’t dry out. Then I added some water to the second pan that held more squash. No sooner had the water hit the pan then I realized my mistake. This realization happened at exactly the time that the freaking GLASS pan exploded into a million little tiny honeycomb pieces. I stood there, frozen. First shocked, then stupefied and finally, mortified. I screamed out as everyone ran to the kitchen. “I have ruined Christmas dinner!” I knew what I did the minute it happened but everyone else was baffled. Had I dropped the glass measuring cup? Had I dropped the glass pan? “No, this moron poured cold water into the steaming hot glass pan” I told them sheepishly. I was barefoot, as it is the only way to cook, except of course when there is glass everywhere and then it becomes a real hazard. Ali picked me up and carried me out of the kitchen. Bob came rushing in with a broom and vacuum. We tried to salvage the dinner. The ham has been covered in foil so it was ok and the beans had just been taken out of the oven just prior to the explosion. On the other hand, the scalloped potatoes were a little iffy as the foil did not completely cover them and of course the squash was history. We tossed out the bad half of the potatoes and said “DINNER”. Now, normally there was be a mad dash to the table but instead everyone sort of hesitated. My mother-in-law, suggested that we order out for Chinese, which is what every good Jew does for Christmas dinner. “No no, it is fine, there is no glass in the food, please sit down and eat” I said hoping that no one would crunch down on a bit of glass. They all sat down rather reluctantly and my mother-in-law spent the entire meal mashing her fork into her food trying to find glass, despite our assurance that there was no glass in the food. She ate nothing for dinner. The fact that I served ham to my Jewish mother law probably should be seen as a bigger problem than serving her glass. She basically just pushed the food around her plate so that when dessert was served she had 4 helpings of everything from apple pie to pecan pie. It was all my fault that she had to eat all that dessert since I ruined the dinner. So the lesson to be learned here is that you should not use glass pans, that you should not serve ham on Christmas to your Jewish in laws and that I should not be allowed in the kitchen except to make desserts and heat up pizza. Are you all on board with that program?